Food choices are wrapped up in gender identity, which is shaped by cultural messages. Just look at the recent $19 billion industry to market beauty products to men. The U.S. National Health and Nutrition Examination Survey has found that men eat an incredible 57 percent more meat than women. This gender gap can be explained in part by the host of unique barriers men experience when they try shifting their diets toward more plant-based foods. If men’s perceptions of plant-based foods are one barrier, another is their ideas around how they want to be perceived by others. Researchers have found that what we eat is wrapped up with the subtle cues we give to the world about ourselves. On a sub-conscious level, we make food choices, at least in part, based on how those decisions will affect our public image. For example, people who eat healthy foods are seen as responsible, but those who eat pastries and pies are interpreted as fun and easy-going. And if you want to be seen as a “real” man? The research shows that you should eat red meat, and lots of it. Both men and women associate red meat with strength and masculinity. One study found that vegetarian men are perceived as up to 35 percent less masculine than those who follow omnivorous diets. Another study echoed these insights, finding that men who eat a beef-heavy diet are perceived as 20 percent more masculine and 30 percent less feminine than vegetarians. Eating meat, it seems, is a simple way for men affirm their masculinity. All in all, these barriers pose a real challenge for those of us who want to see people of both sexes eat more plant-based foods. Sure, meat tastes great—but animal agriculture puts real strain on water, land, and the climate. Beef generates 20 times more greenhouse gas emissions than beans, for example. 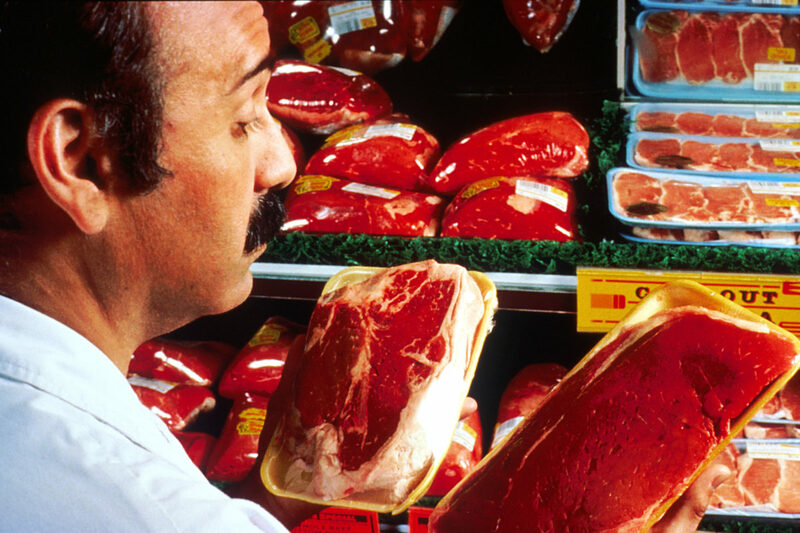 (And red meat eating has been linked to an increase in prostate cancer.) So even small changes in our diets, such as swapping the beef burger for a turkey burger, can have positive impacts. For many, the answer isn’t cutting out all meat–it’s eating less. So what would it take to convince men they don’t have to eat meat to be manly? Not long ago, most men would have told you that using grooming products, beyond hair gel and shaving supplies, was flat-out taboo. But, in recent years, male shoppers have increasingly turned to buying moisturizers, anti-aging creams, and a host of other personal toiletries. This year, the global market for male grooming products is projected to be worth $19 billion. The high-end men’s retail website Mr. Porter reported 300 percent increase in the sale of these products in 2015 alone. With names like “Facial Fuel” and “Urban Camouflage Concealer,” these products are designed to ensure men feel masculine while shopping for lotions and other items long seen as “women’s products.” And the companies behind them have spent millions refining their marketing tactics to emphasize health and confidence as key benefits. Many are packaged in grey or black containers—often resembling cigar or liquor packaging—with bold typeface and sparse design. Gone are the days of one-size-fits all manhood, it seems. Even Axe, the body spray company that first made a name for itself with racy ads, has changed its tune. Its latest ads now appear to be playing to the many different kinds of masculinity men are increasingly expressing. This change has happened fast, and it poses a larger question about the power of marketing to shift highly-gendered consumption patterns. Old-fashioned norms of masculinity can be challenged, and new norms developed. And there are a number of individuals and companies working to redefine meat’s hold on men. Beyond Meat, for example, partners with NBA players and other athletes to endorse its plant-based foods. This summer, Impossible Foods worked with critically acclaimed restaurants such as New York’s Momofuku Nishi to add its plant-based burgers to the menu. Because the burger looks, smells, and tastes just like beef, the company hopes men will be more open to trying it. There’s also big money behind the shift. Just this month, a group of 40 investors managing $1.25 trillion in assets launched a campaign to encourage 16 global food companies to replace at least a portion of the meat they sell with plant-based proteins. Many men seem to have built their identities around meat eating, but that doesn’t mean they can’t change. And for young men, there may be fewer messages to undo. This is borne out in the fact that, in addition to women, Millennials are the demographic most likely to adhere to a plant-based diet. All of this should serve as a hopeful reminder that gender norms are far from fixed, and what’s considered appropriate male behavior is highly cultural and dynamic. So if men can change their thinking on face cream, then who’s to say they can’t change their attitudes about hamburgers, too? Karna Malaviya contributed research to this article. Photos via Wikimedia Commons and Flickr/Shreyans Bhansali. Vegans are pushing their agenda from behind the environmental preservation smoke screen with the rapturous encouragement of animal rights zealots. Eating less meat will impact nothing in the environment except perhaps your little social circle, where one more proselytizing vegan may or may not be a welcomed addition. Around here, not so much. Cute maneuver by vegans -- try to spin meat eating into a masculine fault. Because men are evil and because we all know how easy it is to nag a man into changing. Yeah, this should work, no? I eat pastured based meat, especially organ meat, for B12, fat soluble vitamins, essential fats, more accessible minerals and nutrient dense amino acids. I also eat meat because it tastes good & fulfills cravings. When I didn't eat meat for 18+ years, I still craved meat. Call it instinctual, since the entire homos genus ate meat for over the past 1/2 million years. Plus hominids have eaten meat for the past 1.8+ million years. So it's part of my evolutionary diet. Do I eat meat because it's more "manly." Nope not at all. Not to mention pastured meats may be raised in ways that are environmental beneficial esp.beef when well managed sequester carbon & preserve methane sinks. Enough with BS articles Civil Eats. I expect more from you.